On August 22, 1883, eight ladies, who had been meeting informally from time to time to read together, met in the home of Mrs. A.S. Dyckman and formed a reading club. In 1884 more ladies joined and dues of 25 cents a year were voted. Soon the club became too large to meet in the homes. 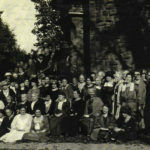 The club accepted the invitation to hold meetings in the parlors of the Congregational and Baptist churches. In 1892, this club accepted the invitation to join others in the building of a club house. At that time, the dues were raised to $1 per year to help and to obtain a charter. The charter was granted May 26, 1892. The Literary and Library Association, the oldest society of the kind in the village, and the Antiquarian Society bought a lot, the one on which the Scott Club now stands. Later, these societies gave a third share to the Scott Club. The town people were interested and they gave most generous with gifts and labor. The club ladies were indefatigable in sparing no legitimate means to provide funds to carry on the building project, dinners, fairs, bazaars, and various entertainments followed each other, in rapid succession. The building was also the club house of the Antiquarian and Literary for a number of years. 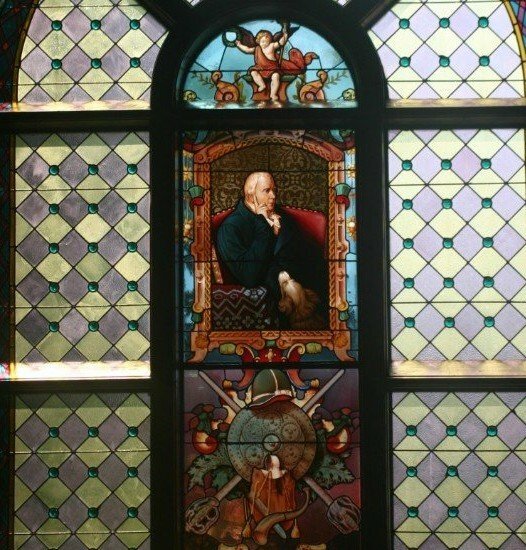 they gave the Longfellow window and James Bates, a close friend of Mr. Dyckman, gave the Sir Walter Scott window. In April, 1892, the Scott Club was incorporated with 42 charter members. 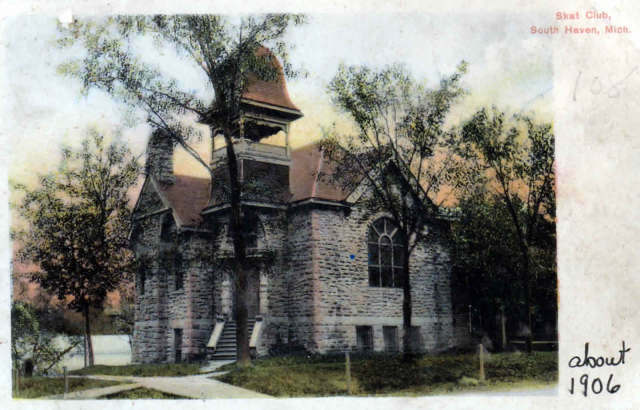 The work on the building went forward and on February 7, 1893, the first club meeting was held in the basement. In 1896, the club library consisted of 126 books. James H. Bates gave 71 volumes of Sir Walter Scott’s novels and several travel books, later books of the Literary and Antiquarian societies were given. These formed the nucleus of the present library. 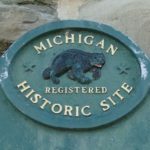 The Scott Club is outstanding among Michigan Clubs for many reasons, but one in particular is that it was one of the first to own a club house. A clipping from the Chicago Tribune of August 21, 1897, is headed, “Club Women of South Haven build a home.” It’s appearance in a metropolitan daily was a great event for the club. On October 1, 1912, the mortgage which had shadowed the beautiful club house was raised and at a banquet in front of members the mortgage papers were burned. The Scott Club set a good example in civic activity, sponsoring the Chautauqua held in 1915-1916. The club organized for war work, the club house was used by the Red Cross, children’s story hours, and a baby welfare campaign was held. The thing that is conspicuous in the early programs, that dates them, is their sweeping and all inclusive topics, like “Famous Cities.” One paper was entitles “Eminent Women.” It included Eve, Cornelia (the mother of the Gracchi, Mary, the Queen of Scots, and Harriet Beecher Stowe. Fagot days were often held. Each lady laid a bundle of sticks on the coals in the fireplace and as they burned, she told a story, sang a song, or spoke a piece. 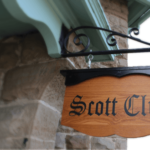 As years have passed, the some of the programs and last names have changed, but we are still better people because we have been members of Scott Club. – Written by Mrs. Hervey Mitchell for the South Haven Daily Tribune for the Centennial Edition in 1969. 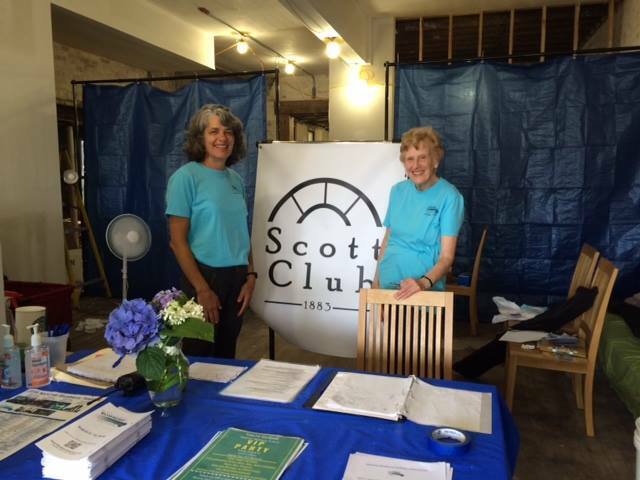 Scott Club membership continues steady at approximately 100 members, which include both long-time and newer residents of South Haven and the surrounding area. While the majority of our members are women, we are glad to include several men among our membership. Members are from all walks of life and provide rich experiences from their fields of education, art, music, corporate America, entrepreneurship, non-profits and more. 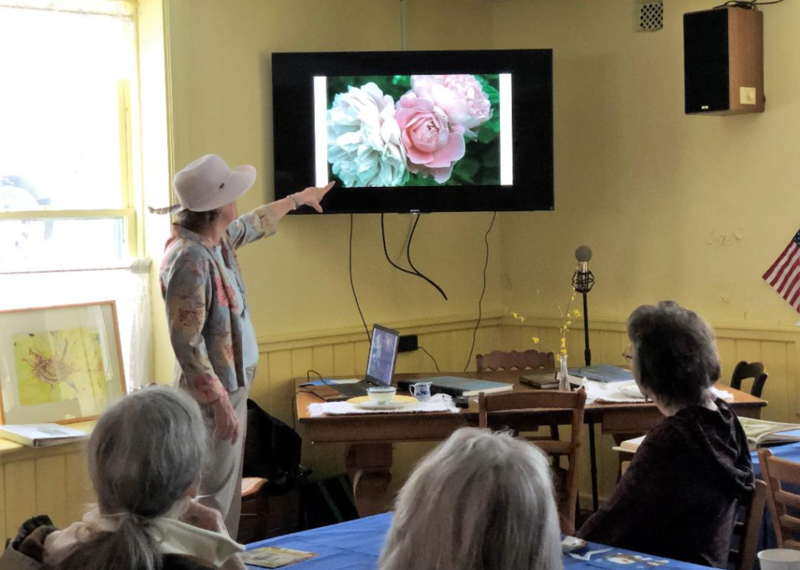 Scott Club continues to offer the community a wide variety of programs by authors, musicians, educators, artists, representatives of charitable organizations and experts on current topics. As the world has changed, so has Scott Club by embracing technology to improve internal processes and outreach. We promote our programs and events on our website, our Facebook page and other social media. An important improvement for accessibility to our programs was the installation of a camera to feed both video and sound of programs to a flat screen on the lower level to accommodate those with mobility or other issues. We’ve entered the 21st century. Parents at poetry night can video their children, we can instantly take a photo and post for all to see, we can share our far- off destination experiences via lap top and television screen and concerts can live stream via their websites. We take stewardship of our building seriously. We raise thousands of dollars through our generous members, donations, fundraisers and grants to replace the roof, repair original ceiling medallions, fix leaks and correct the wood frames on our priceless Austrian windows. Our property looks picture perfect as it did 100 years ago. Yet when it comes down to it, our mission remains the same and seems to be as timeless as our historic building. We strive to be inclusive and diverse, we provide a historically significant South Haven landmark, and most importantly, we are a center for the advancement of culture, the arts, education and fellowship.